Toro Rosso driver Alexander Albon has picked #23 as his full-time Formula 1 race number, joking that he is taking "half" of MotoGP legend Valentino Rossi's famous #46. Formula 2 race winner Albon is stepping up to F1 next year after being re-signed by Red Bull to drive for its junior team. As a Rossi fan, Albon raced with the seven-time MotoGP champion's #46 in karting and won the 2006 British Super 1 title in Honda Cadets in a kart decorated in stickers of Rossi's 'The Doctor' nickname and signage. Albon's race number was missing from the official FIA entry list for the 2019 F1 world championship but he has now confirmed on Twitter that he will use #23. "I've always been a Rossi fan but since I can't replace The Doctor himself, I thought I'd have half of it," he wrote. Last week, Albon's fellow F1 rookie and 2018 F2 rival Lando Norris revealed that he too had considered using Rossi's number and was a fan of Albon's in karting because of his use of #46. Norris opted for #4 for his own F1 graduation as he did not want to appear like a Rossi "copycat". Confirmation of Albon's number came late, as he was only named as Toro Rosso's second driver after the 2018 Abu Dhabi Grand Prix season finale. 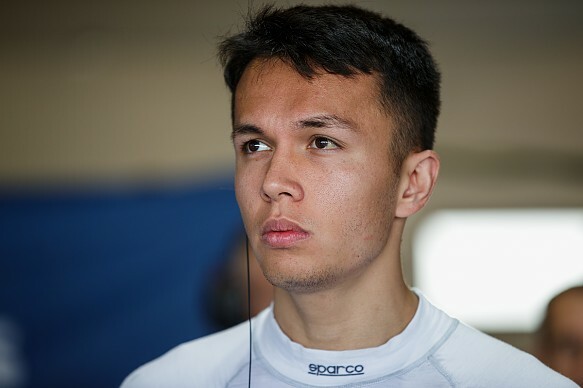 Albon had to extricate himself from a contract to race for the Nissan e.dams team in Formula E for the 2018/19 campaign. He is still yet to sample an F1 car for the first time as he did not drive for Toro Rosso in the post-Abu Dhabi test, but was present with the team at the Yas Marina circuit. Albon has also been to Toro Rosso's Faenza headquarters, having completed his first visit last week.